At the recent RFID Live conference, once again we saw an enormous range of new technologies, applications, and use cases. One thing you count on from RFID is diversity of use cases, and this year’s RFID Journal Live in Orlando did not disappoint. It is impossible to cover even a fraction of what was shown, but here we hit on some of the interesting highlights. 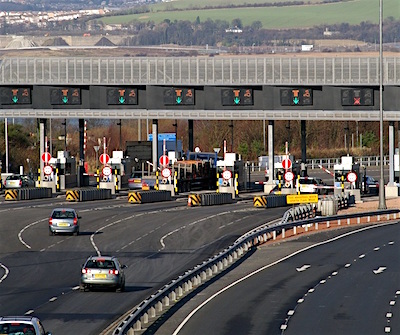 Several of the solution providers at RFID Live provide systems or services for toll collection. Star Systems International (SSI) is a VAD3 serving a broad spectrum of customers, but mostly vehicle-related, such as toll collection, vehicle registration, and parking access control. They sell transponders for these systems, as well as system engineering. In the non-vehicle part of their business, they did a system integration project for Siplast, a roofing materials company that integrates RFID tags into one of their premium products, baking the tags right into the rubber roofing membrane. For roofs covered with that material, the building maintenance crew or their roofing company could read and get specific warranty and other information about the installed roof. In addition, Siplast wanted readers at the dock doors to monitor rolls being shipped. However, after testing many different samples, SSI discovered large variations in performance4 and concluded that dock door readers could not give them satisfactory read range performance. So they recommended going further back into the process and putting a custom portal reader very close to the palletization process in order to get the required read accuracy. SSI provided the reader hardware and wrote the middleware to interface with the WMS system and provide a user interface. RFMicron has taken what is usually considered to be a liability of RFID—i.e. the fact that tags are detuned when near different materials with different amounts of moisture—and turned it into an asset, by enabling the tag to be a moisture sensor. But they do much more than that, providing passive RFID based sensors for temperature, pressure, moisture, and other types of sensors, at a lower cost than traditional sensors and with batteryless operation eliminating the need to monitor and replace or recharge battery-based sensors. At the show, RFMicron demonstrated their Hermes IoT appliance, a small, low-cost, Linux-based IoT gateway device (built using the open-source BeagleBoard design) that integrates inputs from many different types of sensors and protocols. It is intended for use by developers, as well as providing a reference design. A version of this device formed the core of the IoT Platform Development Kit announced by On Semiconductor. This kind of built in sensor begins to fulfill the IoT promise of providing the product manufacturer (in this case the auto OEM) very granular data about how their product is being used. 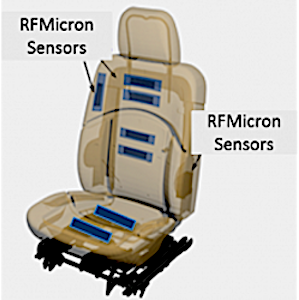 RFMicron is also looking at sensors for many other automotive applications, both during manufacturing/QA (e.g. moisture sensors built into the body can be used during testing to ensure watertightness) and in operations (e.g. lower cost tire pressure gauges). The potential for this kind of wireless sensors in worldwide auto markets is enormous (c. 80M vehicles per year times many sensors per vehicle), especially given OEM’s desire to reduce the amount of wiring in their vehicles. RFMicron showed other applications, such as a highly accurate temperature sensor (± 0.5 °C, with two-point calibration) that could, for example, be embedded in cattle, allowing herd owners to detect sick animals much earlier, thereby preventing the spread of the disease. Another was moisture detectors for use in building materials (insulation, sheetrock, etc.) to aid in certifying that a building is watertight and moisture free. Real-time Locating Systems have been around for a couple of decades and while we’ve seen continual improvements to cost and location accuracy, the cost has remained out of the ‘ROI zone’ for many applications. Recently we’ve seen some quantum leaps in lower costs with continued improvements to accuracy. 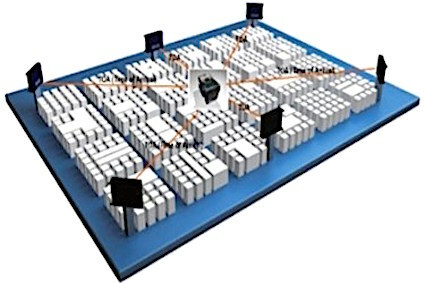 An example is what Bluvision is doing, combining a number of techniques both on the sensors and gateways and in their cloud-based location engine to account for challenging environments, RF reflections, filter out RF noise, and so forth. They said this gives them accuracy down to less than ±1 meter depending on need of the use case. Using this technology, Bluvision has a number of pilots going on. 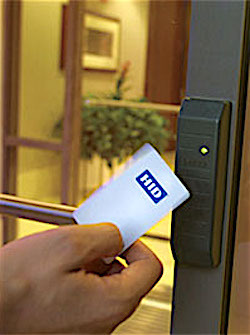 In one use case, combined HID access control technology inside their BLE ID Badge to help a client better manage their office efficiency and security. That client wanted to understand the utilization of the workspaces and make sure that when someone reserved a space they were actually using it. In addition, they wanted real-time visibility and the ability to create geofences, to ensure that people were not going into unauthorized or dangerous areas. This geofencing application requires 1-meter accuracy. Bluvision is also working with a major airline to track people and assets, in real time, across the airlines repair hangers. They have also done asset tracking in other industries and are bringing this technology into retail for merchandizing, employee and path analytics. Another long-standing RTLS technology provider, RF Controls, teamed up with Stanley Black & Decker a couple years ago to form the joint venture View Technologies. They have a variety of overhead ‘smart antennas’ (All-in-One Reader and Phased Array antenna) with the ability to provide continuous 3D location (many RTLS solutions only provide 2D location). One of their specialties is large spaces (think airplane hangars); their Echo smart antennae range in size from 68” X 36” for very high ceilings covering large areas down to 24” X 24” for low ceilings, which will be released later this year. View can address various use cases with the ability to angle their Echo smart antennas to overcome environment challenges, increase scan coverage, and allow for 3-D tracking. The Echo smart antennas are being used for tracking RAIN RFID (Passive UHF) tagged items for Work in Process (WIP), pallet build-up, dock-door scenarios, E-Kanban and various other use cases. Through defining virtual zones within a scan area, a single scan area can be divided into meaningful spaces including individual dock doors, put-away areas, expedite areas, returns and other areas to automate transactional events when tags enter or leave these zones. Continuous location data enables item look-up to quickly find items when needed. They have a goal to make their system easy enough to deploy so that it can be done by facilities personnel, not requiring trained engineers. They have partnered with PTC/ThingWorx, to help enable ThingWorx’ ecosystem of channel and development partners who need RTLS capabilities. Impinj threw their hat into the RTLS ring a couple years ago with the announcement of their xArray gateway. Impinj told me they are able to get to 98%-99% items read within a few hours using xArray. They released ItemSense software last year to go with that hardware and have been making enhancements to it using an agile development cadence to drop a new release about every 6-8 weeks. They recently launched a number of enhancements, including ItemSense Management Console, which discovers gateways and readers on the network, imports the readers’ configurations, and monitors them to ensure that readers remain connected and are functioning properly, with all antennas properly connected. The console can also be used remotely to update the reader’s firmware as well as import maps, define reader’s locations, set up zones with complex polygon boundaries, track items across those zones, and generate events when items move (based on user-defined thresholds and rules). Impinj provides preset reader configurations (they call them ‘recipes’) for frequently used inventory/location scenarios. They have also launched a developer’s site, with tools and documentation. Another RTLS solution provider, Mojix, has a different type of architecture, using a combination of very sensitive readers and distributed arrays of antennas. They have been making moves into retail and more broadly into IoT with their acquisition of ViZix last year. Mojix has been working to drive down the total cost and drive up performance. They told me the retailers they are working with have tested Mojix system against others and said the Mojix system achieved the highest read rates in the shortest amount of time. Mojix is one of very few vendors offering RFID-as-a-Service (including the hardware) via their OmniSenseRF Inventory Service. This service includes not just the software, but also the reader infrastructure hardware, in a monthly subscription service. While it remains to be seen how enthusiastically the market embraces these kinds of services, this approach should reduce risk and speed implementation for retailers, while avoiding some of the upfront capital outlays. We will watch with interest to see if this model catches on. We have written at length on the potential for IoT to transform manufacturers’ business models and service offerings. We heard about one such example from Omni-ID. Their customer, Agilent Technologies, makes, sells, and leases test, measurement, and monitoring equipment. Agilent does all of the maintenance and inventory tracking for their leased equipment, in the past using manual, paper-based processes, which led to errors in billing and lack of reliable information on maintenance, calibration, and equipment location and usage. Agilent selected Omni-ID for their total solution including rugged high-performance on-metal tags and Omni-ID’s asset tracking software solution.6 While Agilent originally intended to use this system just for their own asset tracking, they found this same technology could give asset tracking capabilities to their customers. Their clients could get a better view into what equipment they had at which location, avoiding time spent looking for equipment, or worse yet ordering more equipment when they already had it. This information was valuable enough to create a new revenue stream for Agilent. Instead of selling the tags and readers to Agilent, Omni-ID is selling it as a service, charging by the asset tracked. 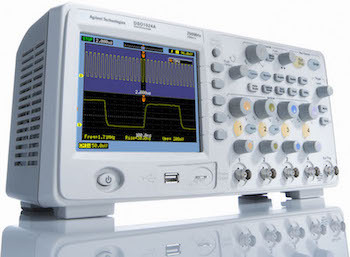 In this way the price reflects the value realized by Agilent and they are not spending ahead before seeing the value. Omni-ID has a thriving business in the manufacturing sector, leveraging their visual tags and inventory/material flow applications. These include capabilities such as ‘pick-to-tag,’ where you peel and stick their visual tags on the front of the shelf and the tag instructs the picker which item to pick next and how many … it less expensive but more informative than pick-to-light systems. As well, they do a lot in factory floor replenishment/e-Kanban, asset tracking, and work instructions (always accurate, up-to-date). In January, Omni-ID closed a $21M round including strategic investments from GE Ventures and YFY group, the world’s leading e-paper manufacturer. The strategic investments make sense, given GE’s focus on IoT and YFY’s interest in encouraging the use of e-paper. Also on display at the Omni-ID booth was their yard management solution, which included an optional drone-based reader. This could be useful for very large yards with inventory scattered all over the place. Brand Protection on the Horizon? The use of RFID for brand protection has yet to take off in a big way, but NXP is aiming to change that with the introduction of ICODE DNA, their ISO 15693/18000-3 compliant HF tag, with 128 bit AES crypto engine and up to one meter range.7 One of the interesting features is that the tags can be read by consumers whose phones have built-in NFC readers. This would allow consumers to do their own verification of the authenticity of the item, whether it is a high end hand bag, bottle of wine, life-saving pharmaceutical, exotic-lumber furniture, or any other high-value, provenance-critical item. In theory, this could be used as a sort of RFID-based QR code—when read with a smart phone, the consumer is automatically brought onto the manufacturer’s website to provide not only authenticity verification, but all kinds of other product-related information—such as provenance (this wine was harvested in this field), information about the craftsperson who made a particular item, other details of the materials and origins, recipes or pairings—and functionality (e.g. registration, warranty, perhaps ability to network with other owners, and so forth). This is still speculative, but if such information and functionality proves to be valuable enough that large numbers of consumers start using and reading these tags with their phones and those consumers agree, via some kind of opt-in/quid-pro-quo mechanism, to allow the information they read to be shared with manufacturers, it could provide those manufacturers with a crowd-sourced inventory management capability; potentially solving issues for manufacturers beyond anti-counterfeiting, such as in-channel product tracking, reduction of grey market/parallel trade activities, information about level of interest (number of reads) at different locations and times of day, and so forth. It is too early to tell whether NXP has cracked the nut on getting the use of RFID for brand protection to a critical mass, but this is certainly something we will be watching with intense interest. The RAIN RFID alliance was founded two years ago by four founding members (Google, Intel, Impinj, and Smartrac). By their inaugural meeting in September 2014, they had a total of 48 members. When I met them at the show, they had 108 members, with more showing interest. Their mission is to promote awareness of and accelerate the adoption of the RAIN RFID (aka passive UHF, EPC Gen2, ISO 18000-6C). They are about to publish a white paper focused on tag performance, reader performance, and solution performance, embracing the Tagged-Item Performance Protocol (TIPP) developed by GS1 with Auburn University. RAIN recently started four sub-teams focused on markets: Retail, Healthcare, Manufacturing, and Logistics. 45 RAIN members had booths at the RFID Live show and many more showed up for RAIN’s reception. RAIN has been having three face-to-face meetings each year; one in the Americas, one in Europe, and one in Asia. These meetings have been expanded to three days, which demonstrates the level of commitment and investment that members are making. We are seeing some of the fruits of their efforts, with more and more people adopting the RAIN moniker to describe passive UHF RFID. Hand held readers are the workhorse readers for retail and many other industries. 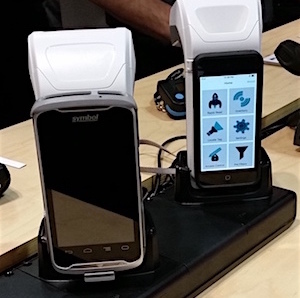 Zebra showed their latest RFD8500 handheld RFID sled, which can run with just about any modern smartphone. It uses a standard generic Quad Lock8 to quickly and easily attach/detach the phone and pair via Bluetooth with iOS, Android, and Windows-based phones. It can also be used with Zebra/Symbol’s TC55 ruggedized Android device with which it automatically pairs using NFC to initiate the pairing. Zebra told me this reader has been optimized to be able to read 700 tags per second, considerably faster than other handheld readers. Zebra said this reduces by 30%-35% the time it takes for store associates to take inventory by, based on their testing with customers. That should result in substantial labor savings and/or more frequent counting (hence higher inventory accuracies). SML provides many branding solutions to retailers beyond RFID. But RFID is increasingly important for them—they expect to sell around a billion RFID tags this year, representing substantial YoY growth for them, faster than the industry as a whole. Part of their success can be attributed to their large network of service bureaus9 around the world, near the apparel and footwear manufacturers where the source tagging is taking place. Another factor is their Clarity retail software (the latest version was selected as a finalist for RFID Live’s 2016 Best New Product Award). Their software is used not just for cycle counting, but to drive daily tasks such as back-to-front of store replenishment, omni-channel picking, markdowns, and inter-store transfers. It can also provide ‘Geiger-counter-like’ locating capabilities10 to help associates find and pick items for omni-channel orders. Known for their integrated store vision, Tyco announced in January that they are merging with Johnson Controls. Tyco has a major footprint in many buildings with fire sprinklers, fixtures, security systems, as well as in retail stores with EAS, video surveillance, and RFID. When merged with Johnson Controls’ building efficiency unit (HVAC, building management systems, fire, security, building retrofits), the combined business will be a formidable force. Tyco itself made a number of RFID/store-related acquisitions recently, including Creativesystems, FootFall, and ShopperTrak. This means that, even before the merger, Tyco was rationalizing and integrating their various platforms—the three mentioned above, along with TrueVUE, and the Tyco ON (their IoT Platform). Some of this functionality is fairly retail-specific, but much of it (especially Tyco ON) can be applied more broadly as part of a ‘smart building’ platform. With plenty of integration work (products, systems, organizational) ahead of them, the new combined company has the potential to dominate the smart buildings platform space, a space that is still being defined but with enormous potential. RFID will play an important role, working together with many other technologies, and big data analytics bringing it all together. Tyco told me they hope to offer these technologies ‘as-a-service.’ That makes sense, not just for delivering Software-as-a-Service, but also the hardware infrastructure (readers, wireless devices, video, sensors) as a service, easing the adoption hurdles, speeding implementation, and enabling building owners to make these part of their operating expense rather than upfront capital expenses. Checkpoint’s EVO printer encodes, checks (and diverts if not properly encoded), prints variable data (e.g. serialized barcode), checks for correct printing (and diverts if not properly printed), flips and prints the other side, verifies again that the tag can be read properly, and sorts the tags (for example by size, category, color, etc. )—all in-line at an impressive 38 meters per minute. The same printer can do color-by-size printing within the same run using the variable data capabilities. 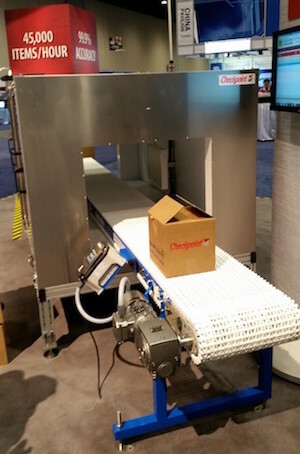 Checkpoint also had their tunnel reader on display at the show which gets 99.9% read rates (less than one in 1,000 error rate) on high speed conveyors running at up to 300 feet per minute. While there, I had them run a number of tests at high speed and in every case it read 100% of the items correctly. They already have over 100 of these deployed. Earlier this year, Checkpoint announced they are offering RFID Software-as-a-Service, comprised of their Merchandise Visibility solution, enhanced with Microsoft analytics. They are branding this service Sense + Respond. Invengo continues to expand through both organic growth and acquisitions. They recently announced acquisition of Tagsys’ laundry and logistics businesses. Invengo already has product lines and presence in retail, library, rail, pharmaceutical, and other industries. Headquarters are in Shenzhen, China where the company has its roots. In 1993 it started implementing RFID for China Rail and now has RFID-enabled over 100,000 kilometers of tracks and over 1 million freight cars, passenger cars, and locomotives. After the Tagsys acquisition, they have eight different businesses, over 600 employees, and sales in every continent. They are vertically integrated, making their own tags, readers, software, and services … one of the reasons that Tagsys was a good fit. They are listed on the Shenzhen Stock Exchange with a market cap of roughly $2B. It is an interesting case of technology originating in China and then spreading to the rest of the world. 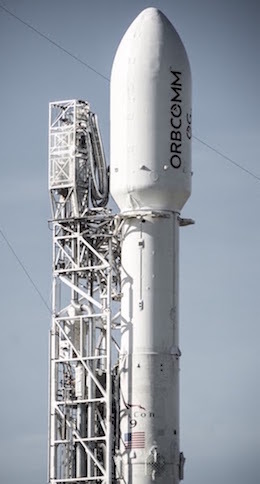 Publically traded on NASDAQ (ORBC), ORBCOMM provides end-to-end IoT solutions including devices, connectivity, and IoT software. Last year they acquired InSync Software, a provider of IoT-based tracking, monitoring, and inventory software solutions. Their IoT platform enables the rapid development of scalable applications to track and monitor assets, parts, products, or tools via RFID, GPS, barcodes, and sensors. ORBCOMM’s capabilities extend beyond IoT application enablement. In December 2015, the company launched 11 more satellites to complete their OG2 constellation of LEO11 satellites, providing global coverage for M2M applications. ORBCOMM has a strong presence in fleet management and logistics (especially refrigerated transportation), containers and ports, oil and gas, utilities, agriculture, and heavy equipment telematics. In the latter, they provide the connectivity and the applications/dashboard to track things like engine operation, maintenance, fuel consumption, and customer-specific capabilities. In Maritime, they provide parts of the AIS vessel tracking services. In the never ending quest to make the most sensitive RFID chip around, the major vendors play leapfrog, taking turns being in the lead. Well now it is Alien Technologies’ turn, as they introduced the Higgs-EC, currently the most sensitive passive UHF chip available (-22.5 dBm read, -19 dBm write). It includes Sentinel™ Memory capabilities to detect dual bit errors and actually correct single bit errors. This can help keep marginal chips such as those compromised during conversion, from providing incorrect data out in the field. This becomes increasingly important as the industry moves from shipping millions to billions of RFID tags per year. The Higgs-EC also supports 200,000 write cycles, double what the other RFID chips on the market are specified for. Avery Dennison RFID is is the largest provider of UHF tags for retail, where they continue to see strong growth. They also are actively pursuing other areas such as maintenance parts or baggage tracking. A newer area they are focusing on is perishable goods, such as meat, fish, and produce, which they believe can be more efficiently handled and waste reduced using RFID. They are running a couple of pilots and seeing lot of interest. In the UK it is a criminal offense to sell out-of-date dairy products, so retailers expend a lot of labor continually checking the dates. RFID could provide this visibility much faster. An idea being considered is using RFID to provide an automatic discount to customers who buy perishable goods that are close to the expiration date. The price could be adjusted the right amount to ensure selling almost everything before it expires without marking down too much, much like the markdown optimization is done in the fast fashion world. Another area Avery Dennison is pursuing is improved visibility of the fresh food supply chain. Furthermore, by better tracking of temperature throughout the lifecycle of the product, the shelf life can be known with much better accuracy. This would be carton-level tracking. In meat and fish, it would be item-level tracking at the store. Avery Dennison believes meat tracking has a solid ROI. They are testing this out with some interested retailers, to prove out both the technology and the business case. 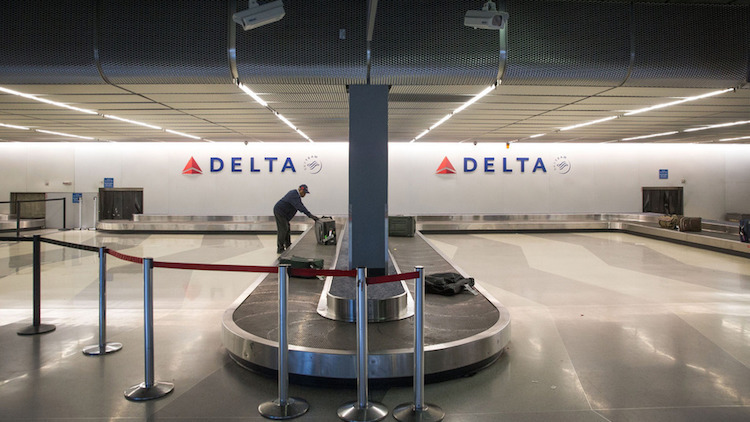 Delta Airlines recently announced that it will be RFID tagging and tracking the 120 million pieces of luggage that it handles annually. That is exciting news, especially if other airlines follow suit. Initial deployments have shown 99.9% tracking accuracy,12 which would represent about a 50X reduction in misreads compared with the current 95% accuracy13 of barcode-based systems. Several of the solution providers I talked to said they are providing various components of the overall solution, but they could not be identified publically until Delta agrees. Hopefully this article has given a taste of what was shown at the conference and has shown that the RFID industry is still vibrant and growing, riding the wave of interest in IoT, as well as the increasingly well-established business case for many of these uses.